In our new series on water security, we take a look at how shortages of the planet’s most vital resource will carry major conflict risks in the near future. In each article, we will explore the water conflict risks facing a new region, and how these conflicts might play out. In part one of the series, we examine how the critically important seawater desalination plants of the Arabian Gulf coast could become strategic targets in the event of armed conflict between Iran and the Gulf States, or to terrorist groups, and how the destruction or damaging of these sites could be catastrophic for regional populations. During the First Gulf War, the Iraqi military destroyed Kuwaiti energy and desalination plants before conducting what was arguably the largest act of environmental terrorism in recent memory by releasing millions of gallons of oil into the sea, threatening the region’s critical desalination plants. Saudi Arabia was at the time already so dependent upon Gulf-based water desalination facilities – Riyadh itself had only 3 to 4 days of potable water on hand at the time and the same facilities which supplied the capital also supplied about half of the nation’s drinking water – that the U.S. was forced to launch airstrikes on the Kuwaiti refineries creating the spillage to halt the flow into the Gulf. Today, Iran has replaced Iraq as the Gulf States’ principal rival, however the vulnerability of desalination infrastructure remains. Several decades ago, long before the economic boom of the modern oil era drew massive expatriate populations to the Gulf metropolises, the small local populations relied on a handful of groundwater wells in order to support themselves and their livestock. Since then, the populations of the Gulf states have skyrocketed far beyond the ability of traditional local groundwater wells to support them as booming economies have led to increased births and an influx of expatriate workers. In order to avoid mass water shortages, the Gulf states turned to alternative sources in order to provide drinking, bathing, industrial and construction water. Kuwait was the first of the Gulf States to turn to seawater desalination as early as 1957, but was shortly followed by Qatar and the United Arab Emirates (UAE), and then in the 1970s by Saudi Arabia. In the case of the UAE, seawater desalination has been used to meet shortfalls in water requirements, complementing the groundwater reserves under the Northern Hajar mountains, which are able to satisfy over 70% of Emirati water needs. The nation sees an average summer temperature of 46°C with a humidity rate along the coastal areas regularly reaching 100%. Despite the high surface water evaporation rates caused by this inhospitable climate, rainfall is uncommon and irregular, with average annual precipitation below 160 mm. The water scarcity situation facing the country is compounded by saline intrusion into, and the non-renewable nature of its groundwater reserves which have been estimated as due to spoil as a usable source in the next 16-36 years. While Abu Dhabi claims that it is developing technologies to increase rainfall over the desert nation, the reality is that desalination remains a critical system for providing water to this overpopulated land. At present, the country’s energy resources and financial wealth enable it to comfortably meet its food and water needs through desalination and import, however these systems present a significant vulnerability in the event of a major regional conflict. In the case of Qatar, the need for desalination is even more extreme in the absence of significant natural freshwater reserves, meaning that approximately 75% of the nation’s water needs are met through seawater processing. Even the groundwater that the small peninsula nation does possess are slightly saline, meaning that they also require processing for potability. Seawater desalination is not a particularly efficient process, with unit water costs reaching as high as five to ten times above those of conventional resource exploitation. Additionally, the process is damaging to local environmental systems while also getting more difficult over time due to the thick saline residue left over from desalination. 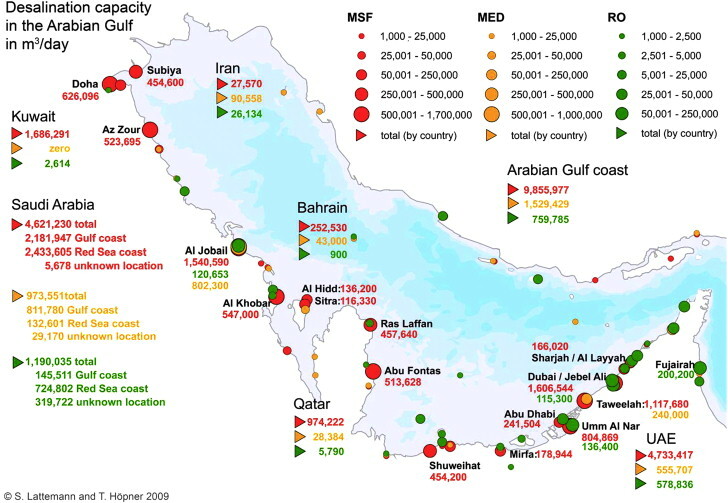 Despite these costs, desalination remains the only real option for the Gulf states, which are home to 1,483 water processing units, or 57.9% of the worldwide desalting plant capacity. In the event of a cross-Gulf conflict with Iran, massed volleys of ballistic missiles from Revolutionary Guard rocket forces could be used to overwhelm the PAC-3 Patriot and (due to be installed in the near future) THAAD air defence systems protecting strategic infrastructure along the southern coast of the Gulf. While the Gulf States possess significantly more advanced air forces than Iran, missile defence is an extremely tricky business and has caused significant frustration for Saudi-Coalition forces fighting Iranian-backed Houthi forces in Yemen. Gulf State air forces would likely have medium-term success in destroying much of Iran’s missile launching capability throughout the south of the country, but almost certainly not before damage had been done to Gulf infrastructure. Such a conflict would be messy, and would undoubtedly result in damage to at least some of the region’s fragile water infrastructure, resulting in a rapid and deadly humanitarian crisis of extreme proportions. Regional military commanders have also been increasingly concerned by cyber attacks against critical national infrastructure. The former chief of the United Arab Emirates’ air force said in 2012 his country’s advanced cyber infrastructure made it a favoured target for attackers, and that same year a virus infected 30,000 computers at Saudi Arabia’s national oil company, Saudi Aramco, aimed at stopping hydrocarbons production at the world’s largest oil exporter. Similar attacks could be brought to bear against water processing stations, even outside of the scope of a declared conflict, or in the muddled early hours of war breaking out. A targeting of water infrastructure by non-state actors also presents a major threat to the Gulf states. Terrorist groups could conceivably seek to sabotage or strike desalination facilities, potentially causing longer-timeframe casualties in excess of any historical act of terrorism. For the Gulf States, their allies, and private sector entities operating in this commercially active region, it is crucial to recognise the vulnerability of water supplies for the civilian population, and to factor this in to conflict and crisis planning. Realistically, little can be done to protect desalination infrastructure from all threat vectors, especially when considering the infeasibility of preventing oil spills and radiation incidents across the entirety of such a geopolitically volatile waterway, combined with more direct threats such as terrorism and inter-state conflict. As a result, beyond hardening desalination facilities as much as possible, a rapid response to an incident in terms of relief, evacuation and aid should also be considered critical to planning for the region’s future. Whilst the Gulf has blossomed economically over the past half-century, this has resulted in local resources being stretched to cater for populations far in excess of what could naturally be supported. The sustainability of this arrangement is questionable and should it collapse the most likely outcome is a frenetic scramble for resources with casualties due to violence and deprivation of basic necessities likely to number – at a minimum – in the many thousands.